In recent years, pepper anthracnose caused by Colletotrichum spp. has become a significant problem on some farms in southern New Jersey. Unlike in tomato, where symptoms are only present in mature (red) fruit, pepper anthracnose can infect pepper fruit at any growth stage. The pathogen overwinters, albeit, not very well on infected pepper fruit left in the field or on the plant at the end of the production season. Because pepper anthracnose does not overwinter very well, it always starts out as a ‘hot spot’ in the field and then fans out directionally with the prevailing direction of the wind and driving rain. Hot weather along isolated afternoon and evening showers our ideal conditions for anthracnose development. Currently, there are no commercially-available bell or other pepper types with known resistance to anthracnose. Reducing the amount of inoculum originating from the initial source (i.e., hot spot) is critical for managing pepper anthracnose. If a ‘hot spot’ is found in the production season, all fruit (of any size) from the infected area and from nearly plants should be strip-picked and discarded appropriately. Importantly, any infected fruit left in the field after the production season has the potential to act as a source of inoculum the next season. Therefore, it is critically important to take the appropriate steps to help reduce that chance. After harvesting, all fields should immediately mowed or hit with gramoxone. All plant debris should be thoroughly worked back into the soil so it can start to break down as quickly as possible. Abandoned fields with plants still standing going into the fall/winter only act as an increased source for inoculum. It’s a misnomer to think that the cold winter weather will help breakdown and reduce inoculum found on infected plant material left on the soil surface. It’s much better if that infected plant material is worked back into the soil where other soil microorganisms can help with the process. On farms with a history of pepper anthracnose, precautions should to be taken each year. The first, if possible, is to rotate away from those areas of the farm with anthracnose for as long as possible. Remember, it can survive (although not very well) in the soil for many years. Importantly, the same pathogens that cause tomato anthracnose (Colletotrichum coccodes) and strawberry anthracnose (Colletotrichum acutatum) are the same pathogens that infect pepper, so rotating away from fields heavily used in tomato and/or strawberry production remains extremely important. Fields need to be scouted as soon as fruit start to develop to locate ‘hot spots’. If ‘hot spots’ are found, all fruit from the immediate and surrounding area need to be strip-picked (or entire plants can also be removed). Growers who have adopted this practice have had success in reducing their losses by reducing the inoculum pressure before the pathogen begins to fan out across the field. Overhead irrigation should not be used in fields with anthracnose problems. 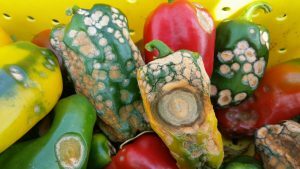 Fungicide programs do work for controlling pepper anthracnose. The sooner fungicide programs begin and the sooner anthracnose is detected via scouting and mitigation efforts taken the better. Fungicide programs for controlling anthracnose should begin as soon as plants start to flower. The key to controlling anthracnose is to get the fungicide to where it is needed the most, on the developing fruit. Planting peppers in a single or double-row fashion may greatly affect your ability to control the disease. Your fertility program may also affect your ability to control the disease. Fertility programs high in N that promote tall, lush, dense canopies will greatly impact how much fungicide gets to where it needs to be. Again, single vs double row peppers will also dictate how much canopy is present. Growers should apply high rates of chorothalonil or manzate in a weekly rotation with a tank mix of either chlorothalonil or manzate + azoxystrobin (11); or chlorothalonil or manzate + Cabrio (pyraclostrobin, 11); or chlorothalonil or manzate + Priaxor (fluxapyroxad + pyraclostrobin, 7 +11); or high rates of chorothalonil or manzate with Quadris Top (3 + 11) or Aprovia Top (3 + 7) with a high volume of water (50 gal/A +) to ensure adequate coverage. Organic growers need to be extremely diligent with proper rotations, regular scouting to detect ‘hot spots’ early and make sure to remove all potential sources of inoculum. Weekly OMRI-approved copper applications may help suppress anthracnose. Other organic products have shown little or no efficacy against pepper anthracnose. For more information please see the 2016-2017 Mid-Atlantic Commercial Vegetable Production Recommendations Guide.